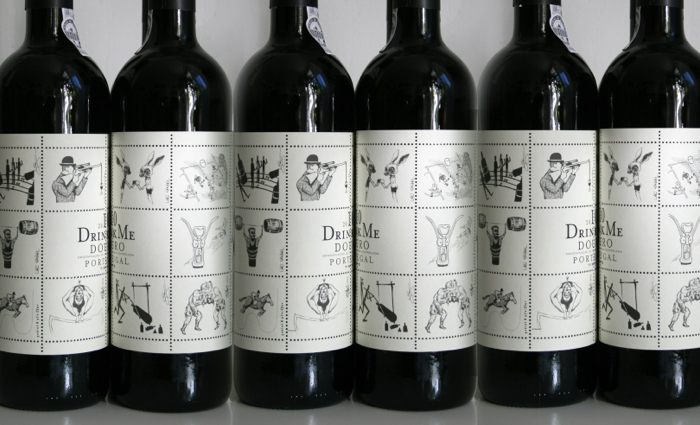 Wine and Art meet on the wine Label and beyond . 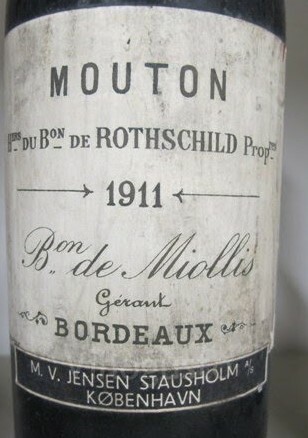 A wine Label is an “invention” of not much more than 120 hundred years. 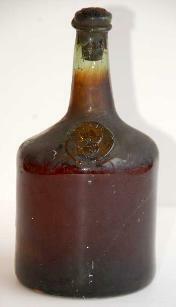 Although nowadays wine labels have turned into a “selling lever” of a wine, an eye catcher for the customer in a wine shop or on the wine shelve in a supermarket, the fly paper for the novice wine drinker, and thus have moved under the jurisdiction of advertizing companies PR advisers and graphic designers some of whom don’t even like wine!!! Having said that, the wine label is still the ID of the wine and any wine bottle is “legally” required to carry this ID at all times! 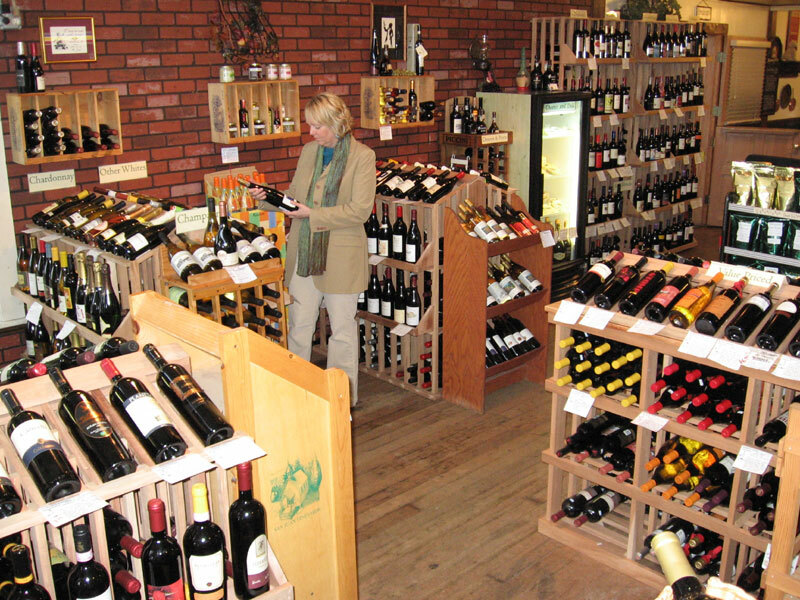 The basic function of the label is to provide the wine buyer with basic information regarding the product which is essentially a “food” or “beverage” product, which is bound by each country’s laws. As any label on a food pack, it has a design which conforms to the legal requirements on one hand and to the owners taste on the other. 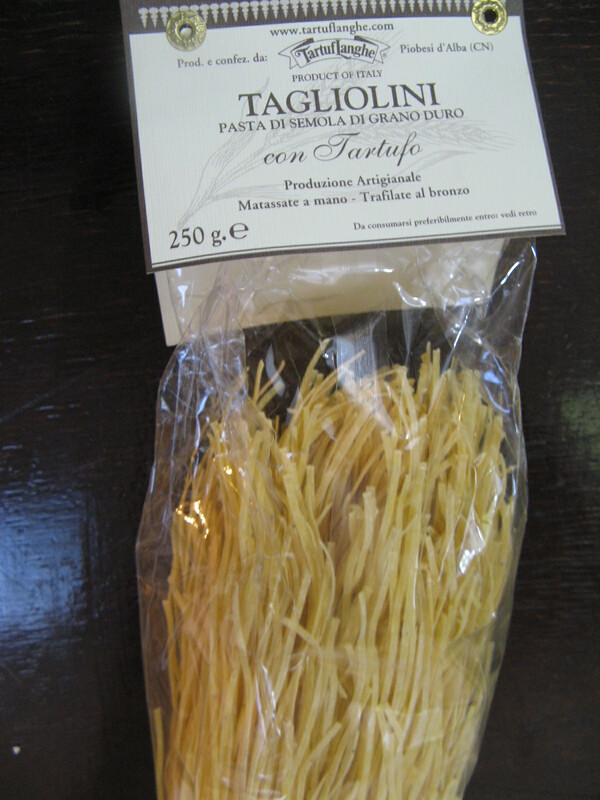 There are “label artists” or “graphic designers” all over the world who produce such labels. Wine has a long history, it was one of the first things that Man created, and had great effect on many cultures and their religious ceremonies. 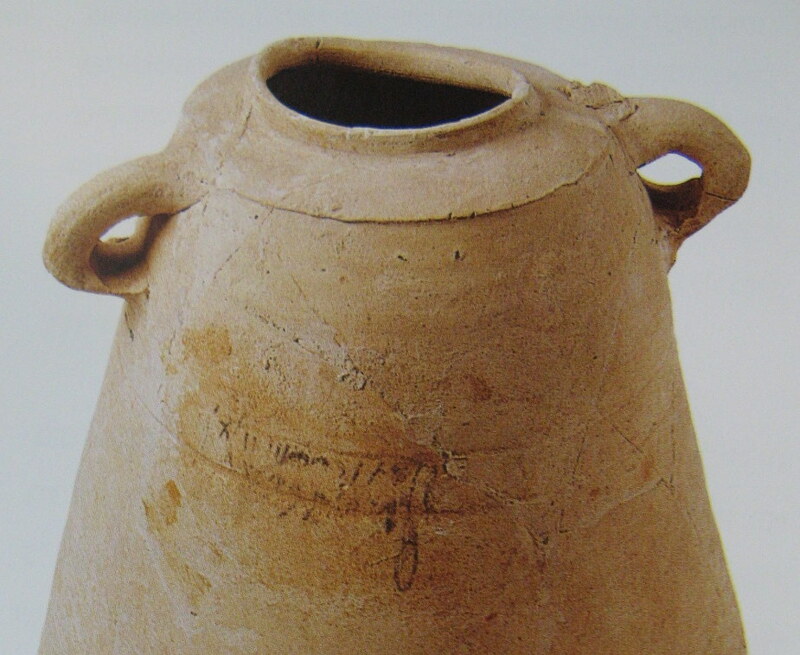 In ancient times the Egyptians the Greeks and Romans recorded the vintage, vineyard and winemaker on individual jars of wine which could be counted as the first wine labels. 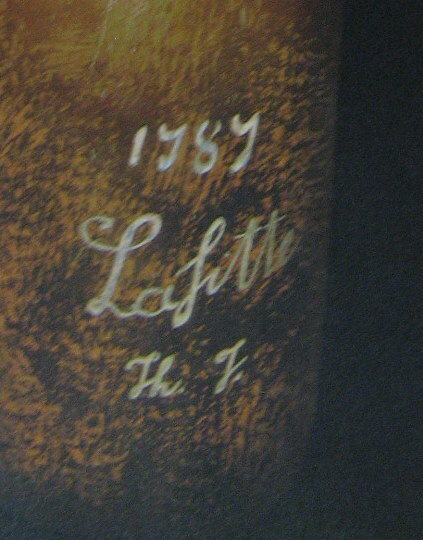 The presumably Lafite 1787 belonging to Thomas Jefferson had the chateaux name and Vintage year and the initials ThJ for the “owner’s” name hand written directly on the glass with “glass paint” possibly by the Chateaux, so were other 19th century Vintages. 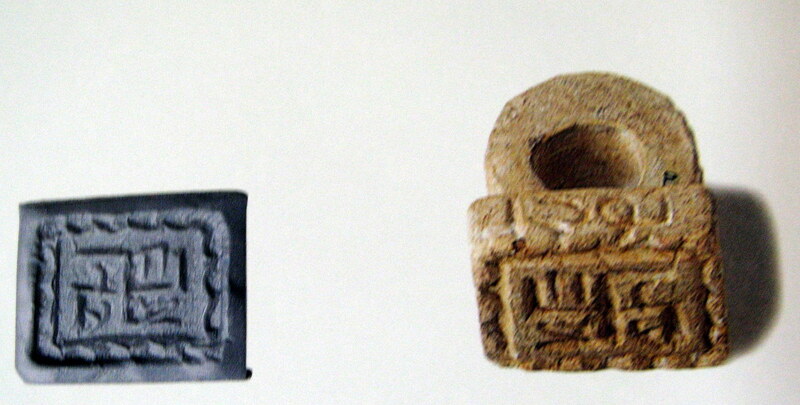 Wine bottles taken away from their region of origin were inscribed on with the wine’s name of producer and Vintage year to allow the buyer or his cellar master distinguish between the different wines in the large cellar of a palace, be it a kings or a Tsar palace (Russian rulers were known to be collectors of Tokaji), they maintained a detachment of Cossacks solely for the purpose of escorting convoys of the precious liquid from Hungary to the royal cellars at St Petersburg. 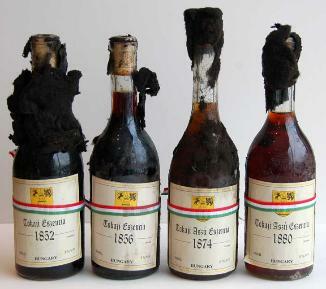 Tokaji reputed to last at least 300 years, was considered a secret potion of eternal youth. 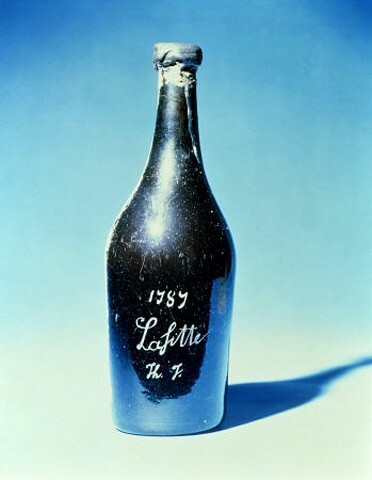 From the days of Tsar Peter I, the Great (1672-1725) for more than 100 years the Romanov family accumulated bottles of Tokaji in their cellars, surely there was enough for everyone but again, someone had to be there to know who is who? At the zoo…Surely someone made sure he will be able to tell between bottles of different Vintage years. Same goes to the Kings of England and their affinity and connection to Bordeaux, or the cellar collection of the Kings of France to name but a few. Until 1924 most wine producers were busy working at the vineyard and at the winery making wine in barrels, that they sold the wines bulk in the barrel or casks to wine-merchants, who then were responsible for the “faith” of the wine. Decisions of how to treat the wine in the barrels were out of the producer’s hands. 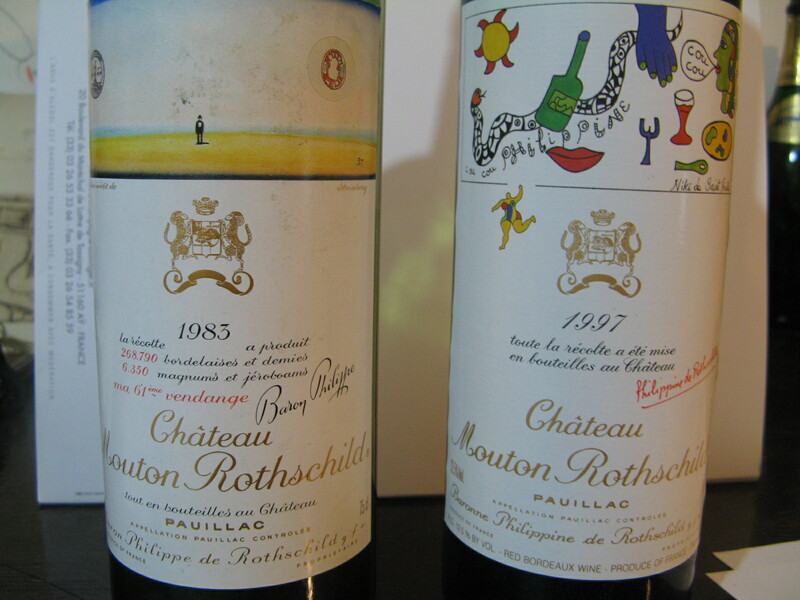 The bottling process was done by wine merchants who labeled the wine under mixed names of chateau and vintage and their own name. The winery had no say over the finished product and had no real interest on the appearance of the bottle or the label. 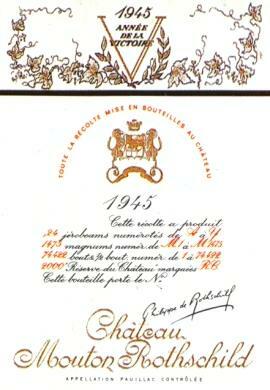 All of this was going to change when in 1924 Baron Philippe de Rothschild decided to bottle the entire harvest before it left the winery (MIS EN BOUTEILLE AU CAHATEAU / DOMAINE.) . 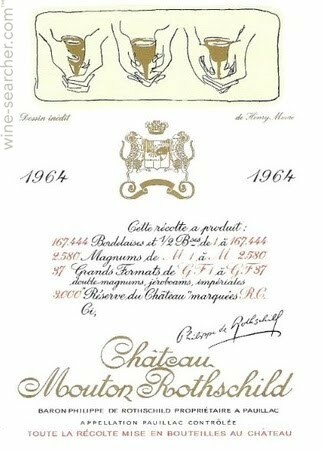 This decision changed the wine world completely and gave the Chateaux/winery, complete control over their product and its final quality. 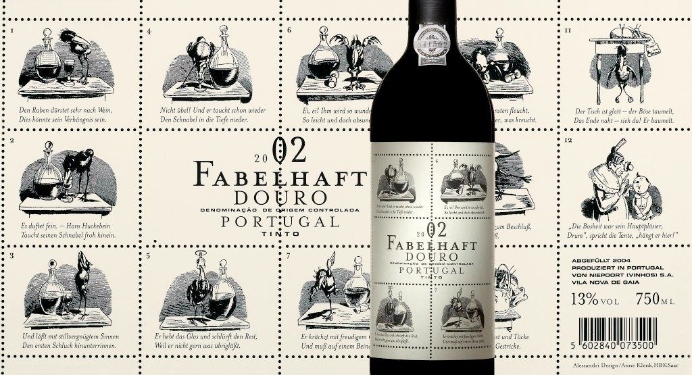 By adding their own label on their wine as a trademark stamp of quality boast: “This is our wine and we stand behind it and its quality under our name and reputation”. A logo to reflect the winery as an individual, to separate “our” wine from others, that bore the first logo as we know it today, and to commemorate this “cry for independence”. 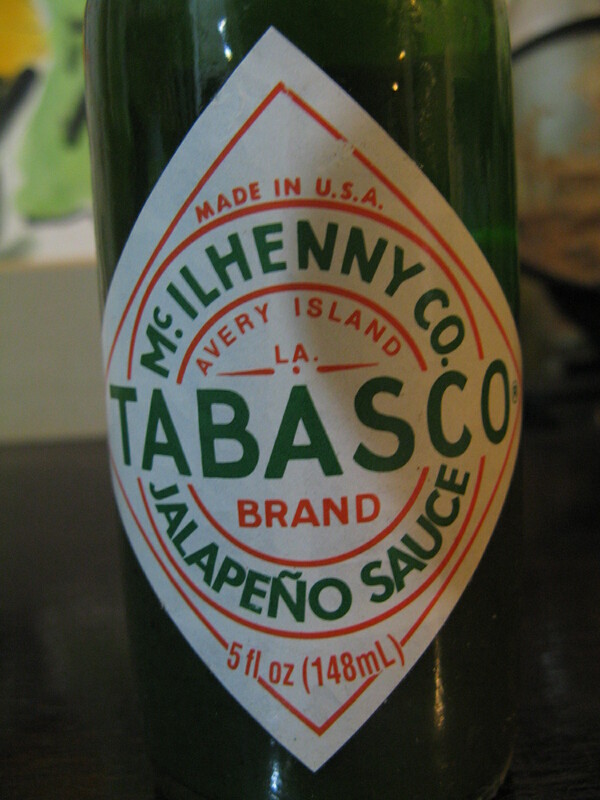 The Logo was ordered from the famous poster artist Jean Carlu, who designed a logo that was used for the 1924 Vintage. 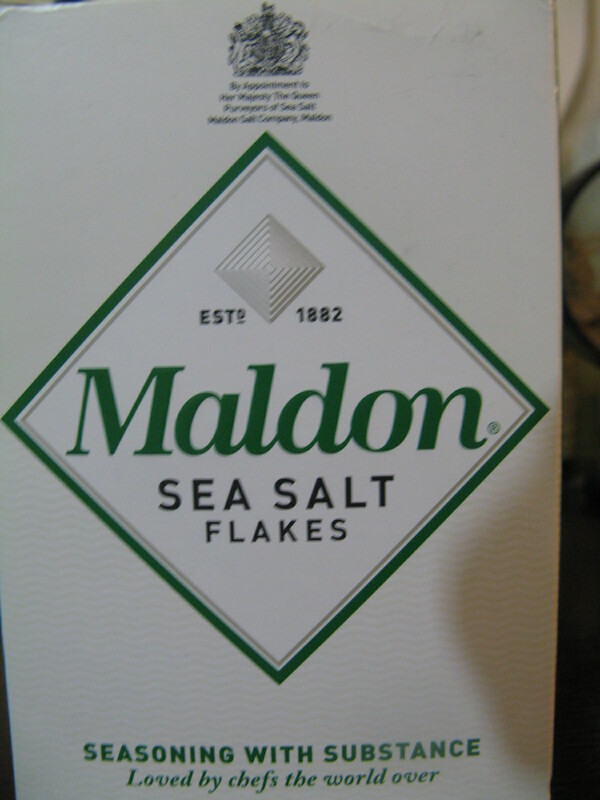 The result was a stunning cubist design, which is considered till today as the most successful example of contemporary art influence on a commercial package design. 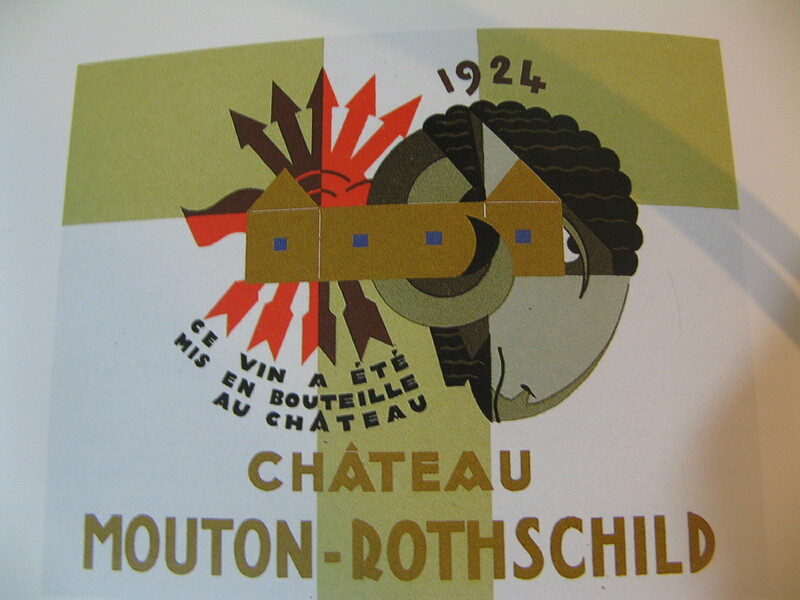 The basic theme of the 1924 poster was turned into a “family crest” stile logo; the label carried the Bottle number in that vintage year and the chateau name: Mouton Rothschild… All until the legendry 1945 Vintage not only it came at the end of the bloodiest war mankind ever knew but considered to be amongst the 20th century 5 top vintages the fact that it was the victory vintage, following World War II only added to its legendary status. 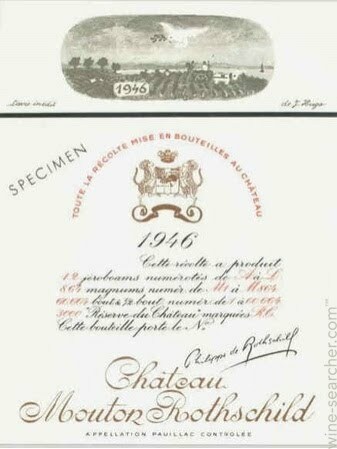 The Labels that followed: The 1946 Vintage label, was commissioned to Jean Hugo (grandson of Victor, who also used a biblical symbol of peace the dove returning to the ark after the flood with an olive branch, commemorating the first year of peace. After that most artists commissioned where substantial figures in the art world of their era: Cocteau, Braque, Dali, Moore, Miro, Chagall, Picasso, Warhol, Herring and many more. 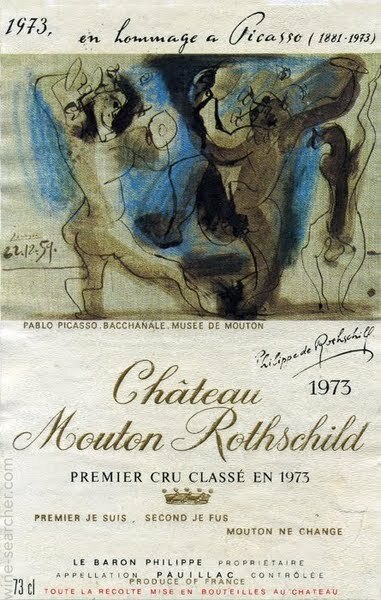 Each year since 1945 a label had been adorned by an artist sometimes (by chance) reflecting the quality and character of the content THE WINE, or just as a continuing tradition of the reciprocation between two art forms complementing each other. 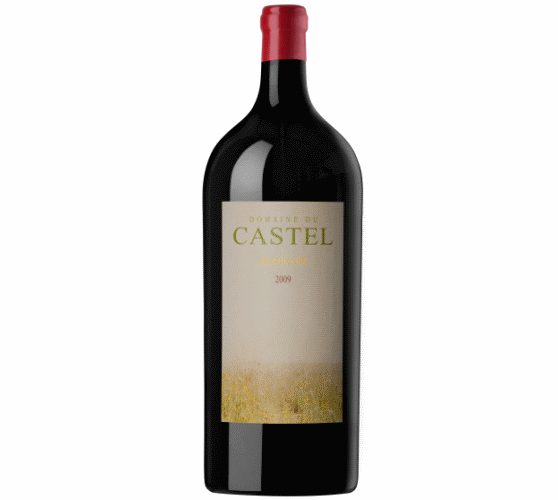 The art of winemaking at its best hailed by top artists paying their respect to a consumable art form, when the bottle is empty all that is left is the carefully “decorated” bottle with its label. 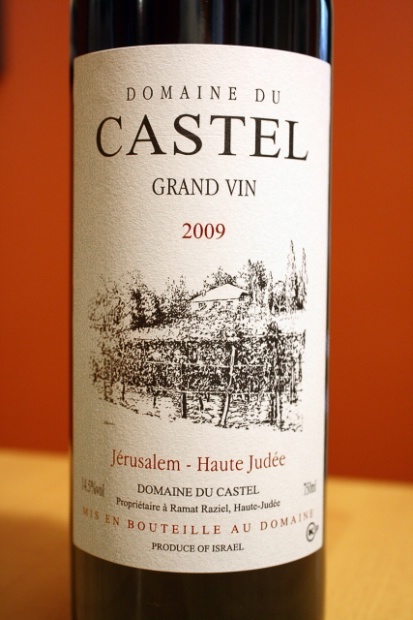 Castel winery Haute Judee, Israel, one of the best boutique wineries in Israel, approached 13 Leading Israeli artists who volunteered to take part in a one off, label project: Arie Azene, Nissim Ben Aderet, Amnon David Ar, Yair Garbuz, Ori Gersht, Menashe Kadishman, Michel Kichka, Ofer Lellouche, Philip Rantzer, Jan Rauchwerger, Gideon Rubin, Eran Shakin, & Yigal Tumarkin, to prepare or choose from their work of art to appear on the Castel Grand Vin 2009 in bottle, magnum and double magnum formats to be sold at auction to the highest bidder. The choice of artists was careful amongst the elite local artists. The benefit will go to the “Threefold Cord” – a non-profit organization which cares for at-risk youth in Jerusalem. 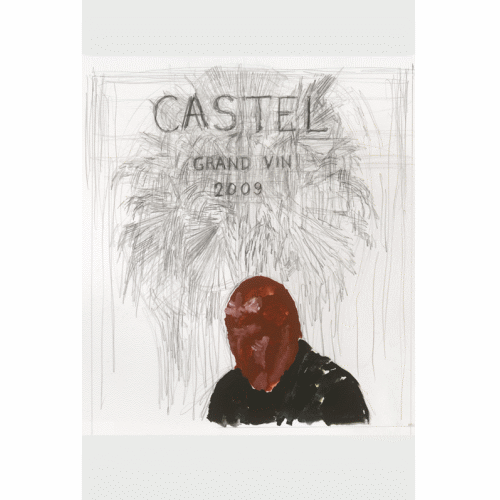 This is Art on a label for a specific reason it is a one off limited edition, for a worthy cause, All commendations are due to the Ben-Zaken family (owners and winemakers of Castel winery), and the artists who donated from their collection a piece of art suitable for the occasion. Most of the above artists believe that producing an Art piece especially for a label is not the idea, and happily contribute a piece of their choice or part of an existing painting. 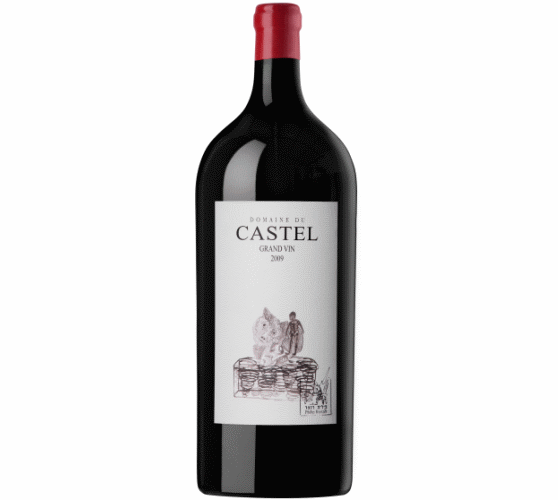 The wine: Castel Grand Vin 2009 , The wine has a deep purple color with strong aromas of black and red berries with a touch of ripe fig and Violets, flavours of ripe Blackcurrants & raspberries with a touch of sweet vanilla and hints of mint. The fruit is full and robust and very well balanced with pleasant rounded rich tannins which give the wine elegant strength and presence to help keep the wine “alive and kicking for another 6-10 years, the velvety touch and approachability on the palate make it a seductive wine and a very good choice for this limited edition. 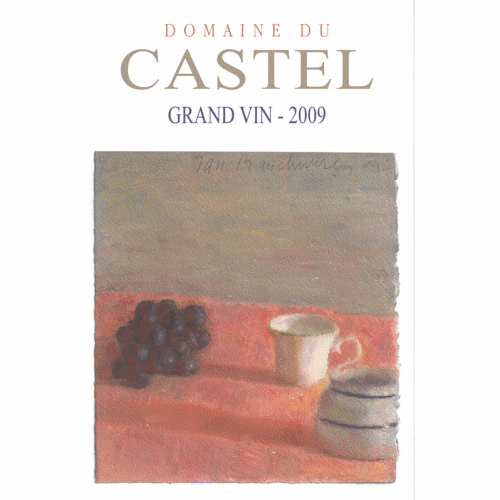 Not that I think it is of great importance (certainly a source of pride for the winery) the Castel Grand Vin 2009 received 92 points from the Wine Advocate annual 2011 tasting of Israeli wines. 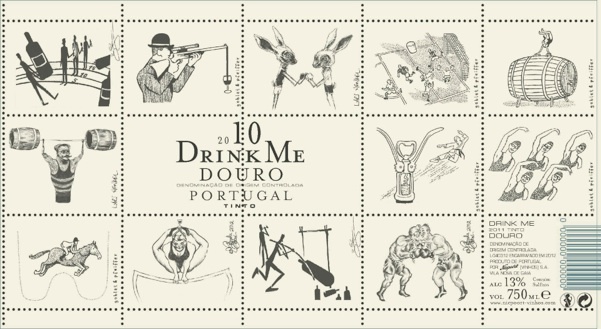 In 2004 Dirk Niepoort and his designer Cordula Allesandri decided to produce an label more suitable and appealing for the German wine buyer with the aim to introduce Portuguese, Douro wines in closer touch to the German wine consumer. Wilhem Busch storyboard label and the name FABELHAFT was the result. Following this trial, Niepoort began to develop different labels suitable to specific countries i.e. : Portugal (Diálogo), Norway (Fabelaktig), Finland (Sarvet), Allez Santé (Belgium), ETO CARTA (Japan), Fantasi (Denmark), Drink Me (UK), Twisted (USA), Berek (Poland), Gestolen Fiets (Holand), OO JA PAEV( Estonia), Ubuntu (South Africa), Sasta (Ireland), Conversa (Brazil). 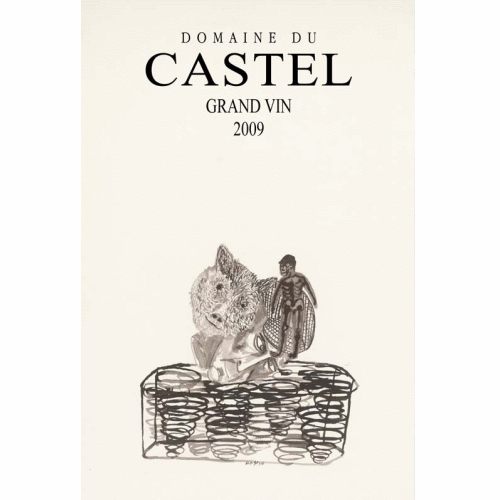 Here the label is an effort to bridge a gap between the wine maker, his locality and aspirations, the character of the wine, and the consumer via an object which is consumed visually at first before the bottle is opened and thus forming an aesthetic dialogue between the label and the wine. The first: “Niepoort’s Soul”, reflecting the “magic of the Douro region through images of the estates and the winery”. The second group: “Projects”, is more “experimentalist” in nature. There is no doubt that wine at its best is a work of ART, does not use fixated idea of an effort to “reach” a certain taste and smell, but a proper use of the product at hand : Use of a given vintage, qualities and character, add a bit of their own geography, geology and climate terroir in short, and turn it into a beverage that is not meant to quench thirst but rather an intellectual sensual travel into the layers of wine and mind from the perspective of all 5 senses: sight, smell, taste, touch and sound. Just like a good piece of Art is the use of paints and colors on paper or canvas that transcends into an object that evokes emotions. In this sense good art and good wine go comfortably hand in hand together, and wine drinkers /appreciators, get to enjoy the finished product.